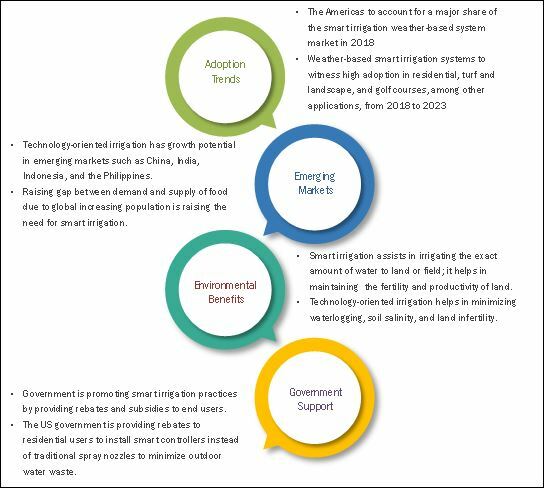 [151 Pages Report] The smart irrigation market was valued at USD 696.2 million in 2017 and is projected to reach USD 1,755.1 million by 2023, at a CAGR of 16.30% during the forecast period. The base year considered for this study is 2017, and the market forecast is provided for the period 2018–2023. Smart irrigation system automatically adjusts the watering schedule based on various parameters, such as plant water content, soil moisture content, wind speed, wind direction, and local weather data. It offers several benefits, such as environmental sustainability, reduced labor cost, and less water usage. Soil sensor-based smart irrigation controllers have gained popularity in recent years owing to their increasing adoption in the agriculture segment. Soil sensor-based controllers are capable of reading precise data from various sensors, such as soil moisture, rain, temperature, and humidity, installed on the field. Sensor-based controllers are better than weather-based controllers as they do not depend on weather forecasts or on data from weather station. Sensor-based controllers capture data from sensors mounted on the field and then transfer this data to the cloud. Sensor-based smart irrigation controllers are preprogrammed according to the level of moisture present in the soil. Controllers start irrigating the zone or field as soon as the reading reaches below the threshold level. 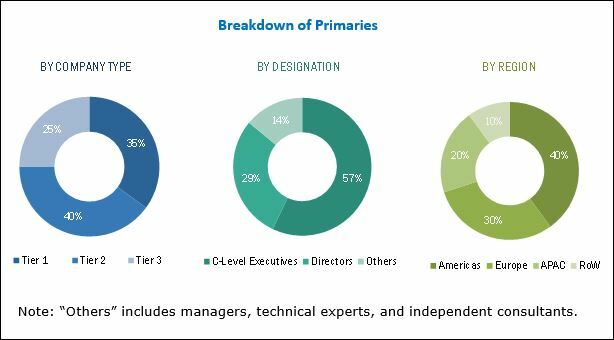 In the smart irrigation market report, both top-down and bottom-up approaches have been used to estimate and validate the size of the smart irrigation market, along with other dependent submarkets. The key players in the smart irrigation market have been identified through secondary research, and their market ranking has been determined through primary and secondary research. Secondary sources used for this research study include government sources and corporate filings; and industry associations such as Environmental Protection Agency (EPA), Irrigation Association (US), American Society of Irrigation Consultants, National Association of Landscape Professionals, Irrigation Association’s Smart Water Application Technology (SWAT), and International Center for Water Technology (ICWT). This entire research methodology includes the study of annual and financial reports of the top players, as well as interviews with experts (such as CEOs, VPs, directors, and marketing executives) for key insights (both quantitative and qualitative). All percentage shares, splits, and breakdowns have been determined using secondary sources and verified through primary sources. All the possible parameters affecting the markets covered in this research study have been accounted for, viewed in detail, verified through primary research, and analyzed to obtain the final quantitative and qualitative data. This data has been consolidated and supplemented with detailed inputs and analysis from MarketsandMarkets and presented in this report. The smart irrigation ecosystem comprises smart irrigation technology providers such as The Toro Company (US), Netafim (Israel), Hunter Industries (US), Rain Bird Corporation (US), HydroPoint (US), Rachio (US), Banyan Water (US), Rain Machine (US), ET Water (US), Galcon (Israel), Weathermatic (US), Blossom (US), Skydrop (US), Delta-T Devices (UK), Calsense (US), AquaSpy (US), Soil Scout (Finland), Caipos (Austria), Acclima (US), and Rain Machine (US). The report describes drivers, restraints, opportunities, and challenges governing the growth of the smart irrigation market. The report also includes critical market data and qualitative information for each type, along with qualitative analysis, such as value chain analysis, market ranking analysis, and competitive situations and trends. The report targets technology providers, software and service providers, system integrators, and end-user industries of smart irrigation. What are new application areas that smart irrigation companies are exploring? Which are the key players in the market, and how intense is the competition? The smart irrigation market is estimated to be worth USD 825.0 million in 2018 and is projected to reach USD 1,755.1 million by 2023, at a CAGR of 16.30% from 2018 to 2023. The major drivers for the smart irrigation market include initiatives undertaken by various governments to promote water conservation, surge in farming operating costs, and growing emphasis on increasing farm productivity and profits using smart irrigation solutions. According to the United Nations 2016 report, the world population is expected to reach 9.3 billion by 2050, and its combined impact with urbanization and the rise of the middle class is bound to generate higher demand for healthy and sustainable food, which would require the current food production to double by 2050. Smart agtech solutions such as smart irrigation would prove instrumental in meeting this goal by optimizing agricultural practices, minimizing waste, developing climate resilience, and providing timely agricultural advisory. The smart irrigation market has been segmented based on component, system type, application, and region. By component, the smart irrigation market has been classified into controllers, sensors, water flow meters, and others. Controllers are expected to hold the largest market size owing to the increasing adoption of these devices for automatic irrigation scheduling in applications such as agriculture, residential and commercial property, lawns and gardens, and landscaping. Smart controllers use weather and sensor data to automatically adjust irrigation schedules to any environmental changes. By system type, the smart irrigation market has been segmented into weather-based and sensor-based. Weather-based system is expected to hold a larger market size during the forecast period. This can be attributed to the increasing focus on farm efficiency and productivity. Weather-based systems have become quite popular among homeowners, commercial building contractors, and landscaping and golf course managers. By application, the smart irrigation market has been segmented into agricultural and nonagricultural. Nonagricultural application is expected to hold a larger market size from 2018 to 2023. The growing importance of efficient watering practices and irrigation solutions for nonagricultural applications, such as residential, turf and landscape, and golf courses, is a major reason for the larger market size of the nonagricultural application segment. Smart irrigation is used in residential applications such as gardens, small plantations, and lawns. Residential users are employing advanced technology-oriented irrigation systems controllers and various sensors to minimize water wastage and water bills. The increasing number of initiatives undertaken by various governments to promote water conservation, decreasing cost of smart irrigation controllers, and growing popularity of automated irrigation solutions among residential and commercial land contractors are the key factors driving the growth of this market. Smart irrigation in turf and landscape is a practice of irrigation dedicated to minimizing water wastage. It involves the application of various technologies, such as rain sensors, soil moisture sensors, weather-based controllers, and sensor-based controllers, to irrigate turf and landscape with minimum water for efficient and effective irrigation. To maintain turf quality and conserve water, more advanced and technology-oriented irrigation is gaining importance. It involves the use of sensors to obtain real-time information on soil moisture level, nutrient level, flow rate, etc. The increasing popularity of smart irrigation technologies, such as weather-based controllers, sensor-based controllers, and smart flow meters, among irrigation consultants, contractors, and irrigation managers is a major factor contributing to the growth of turf and landscape application. In agriculture, crops require a relatively high amount of water for irrigation. This has become a matter of concern for crop growers globally. Population explosion and recent droughts in many parts of the world have put water resources under immense pressure. This has resulted in new approaches toward water planning and management to avoid conflicts. The market for the agricultural application is expected to grow at a higher CAGR during the forecast period owing to the increasing demand for quality food globally, initiatives taken by various government bodies for water conservation, and decreasing prices of smart controllers and sensors. Globally, there are thousands of golf courses that are regularly irrigated. Over-irrigation of golf course field results in wastage of water, energy, and fertilizers, and generates runoff that is likely to have a negative impact on the surrounding environment. According to the data provided by the United States Geological Survey, golf course irrigation accounts for 0.5% of the 408 billion gallons of water used per day in the US. An increasing number of industry turf professionals and council turf managers of golf courses around the world are adopting smart irrigation for the management of turfs. What are the upcoming industry applications for smart irrigation? By region, the smart irrigation market has been segmented into the Americas, Europe, APAC, and RoW. The Americas is expected to hold the largest share of the smart irrigation market in 2018. Countries such as the US and Canada in the Americas are the early adopters of smart irrigation technologies, which is the major reason for the large share of this region in the smart irrigation market. Farmers or growers in this region are increasingly adopting advanced irrigation systems and devices such as controllers, sensors, and smart water flow meters. Major factors restraining the growth of the smart irrigation market are high technological costs, and limited technical knowledge and skills among farmers. Smart irrigation requires high initial investment, efficient farming tools, and skilled and knowledgeable farmers or growers, among others, making farmers apprehensive to use this technology. Key players in the smart irrigation market are The Toro Company (US), Netafim (Israel), Hunter Industries (US), Rain Bird Corporation (US), HydroPoint (US), Rachio (US), Banyan Water (US), Rain Machine (US), ET Water (US), Galcon (Israel), Weathermatic (US), Blossom (US), Skydrop (US), Delta-T Devices (UK), Calsense (US), AquaSpy (US), Soil Scout (Finland), Caipos (Austria), Acclima (US), and Rain Machine (US).